Article first published as Book Review: ‘Cello’s Tears’ by Geza Tatrallyay on Blogcritics. 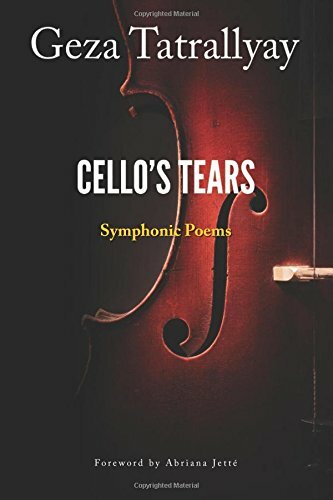 “Cello’s Tears” by Geza Tatrallyay expresses through his contemporary poems, a literal meaning of words. His words in the different languages will express and make you feel the sense of emotions and the beauty and sadness of nature with its colors, incorporating the melody of words in music. once, where I now stand. The language that the author presents in “Cello’s Tears” is so profound that it will translate true feelings into words. More than once in the past years I had to travel to South America where my family lives, and had the opportunity to be on a flight during a sunset. Often I stared out at the blue skies and white clouds into the sunset, and into the dark night as well, as the rain drops slid down the window. During those moments of insight I had the same deep questions about life and nature as the author, and so many still remain unanswered. Reading “Cello’s Tears” by Geza Tatrallyay made me recall those moments, and even answered some of my questions with his simple words. I recommend this book to all poetry lovers and readers looking for inspiration. A five star collection of poetry. This entry was posted in Books, Poetry - Non-Fiction and tagged Book Review, Cello's Tears, Geza Tatrallyay. Bookmark the permalink.